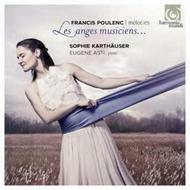 Francis Poulenc’s corpus of songs is one of the most generous and accomplished in the French repertoire. Born in 1899 and living until 1963, he inherited the art of the 19th century, which he succeeded in renewing while remaining within the bounds of tonal language, setting mostly contemporary poets (Apollinaire, Éluard, Aragon, Louise de Vilmorin). He drew his inspiration from the atmosphere specific to each text, but also from listening attentively to the timbre and rhythm of the poet reading his or her own works. This was, in the composer’s view, an essential key to penetrating the mystery of their creations. Associating the specific experience of the poet with his own personal memories, Poulenc created an expressive aura unique in the song output of his time. Belgian soprano Sophie Karthäuser studied with Noelle Barker at the Guildhall School of Music and Drama in London. She is now in great demand in the foremost international venues, especially as a Mozart singer. She sang her first Pamina (Die Zauberflöte) under René Jacobs and her first Susanna (Le nozze di Figaro) under William Christie. She has especially close relationships with the Théâtre de la Monnaie (Brussels) and the Theater an der Wien (Vienna) in Baroque and Classical roles. Since winning the Audience Prize at the Wigmore Hall Song Contest she has developed an acclaimed career as a recitalist, enjoying a particularly close artistic partnership with the distinguished American pianist Eugene Asti. Her extensive discography includes successful releases of aria and song recitals and complete operas. This is her first recital programme for harmonia mundi.